Wisconsin Insurance Commissioner Ted Nickel reminds and encourages consumers to make sure their insurance policy is up to date before the rainy season starts. "Many consumers don't realize that a flood insurance policy has a 30-day waiting period before it becomes effective," said Nickel. "Consumers need to act soon in order to have the protection in place by the time spring arrives." Wisconsin's recent experience with flooding should serve as a reminder to everyone that you don't need to live in a flood plain to be exposed to flooding. Every year since 2007, there has been flooding in the state serious enough to cause significant damage, some serious enough to result in federal disaster declarations. 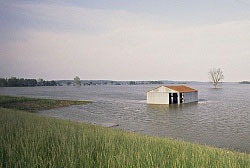 According to FEMA, there were less than 16,500 flood insurance polices in force as of September 30, 2010. While there was 3% growth in the number of flood insurance policies sold in Wisconsin for the same period, "We need to do better," said Nickel. "There is too much exposure and not enough coverage." The standard homeowner's policy does not cover damage to property and possessions in the event of a flood. Just a few inches of flood water can cause thousands of dollars in damage. Flood insurance is relatively inexpensive and is available under the National Flood Insurance Program (NFIP), a federally-backed program managed by the Federal Emergency Management Agency (FEMA). Under the flood insurance program, coverage may be purchased as long as the property is located in a community that participates in the NFIP. To verify if a community participates, check with a property insurance agent or visit the FEMA Website. Information on the program can be obtained by calling 800-427-2419 or visiting www.floodsmart.gov. If you are Wisconsin resident and would like to know more about flood insurance for your personal insurance package contact a knowledgbroker.